So here is the deal. I have created my own application to control DMX 512 Lights. I started with just dimmers and hope to add more GUI support for intelligent (DJ-style) lights and light/group submasters , with support for submaster input from a simple DMX fader board. To start with, I'm using the only hardware I have so far, wich is the Enttec DMX USB Pro Interface. And if I have time, and someone donates a Enttec Open DMX USB Interface interface & I figure out it's API, I'll code this to work with that also. I'm writing in VB.NET., and it will look like many others simply because it will do the same thing. Includes!! 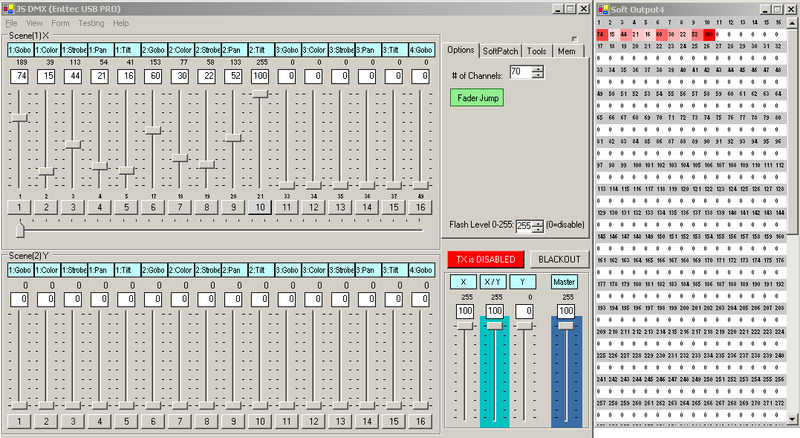 Dual Winamp Controller's - V1.0.2052 See screenshot below. Please try my software and tell me what you think so far, and I'll keep posting the latest version as I change it. FORUMS - so please give me feedback. Ask any trivial little thing. At worst I just won't answer, but I'm hoping to answer everything. Changelog - Regularly Updated!! Details functions of the application as I add them.